Aspergillis Fungus develops in the area of the cage where the hamster urinates. The fungus then grows on the urine patches in the cage and releases spores which then affect the hamster. The fungus can be seen as white and then black in colour in the area where the hamster urinates. Once affected by the fungus spores the hamster becomes lethargic, has difficulty breathing and may have itchy or inflamed skin and sometimes chronic diarrhoea. 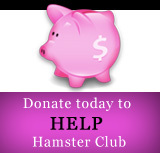 Hamsters suffering from Bladder Infections are more at risk of developing the disease. Prevention is better than cure and the use of a cage disinfectant containing an anti-fungicide will help to prevent the fungus developing. The fungus can also develop on rotting vegetables so ensure that any stored vegetables are removed from the cage. Immediate veterinary treatment should be sought as the hamster will require antiobiotics (Baytrill) and anti-fungal medication (Griseofulvin). Early treatment is vital as once the hamster is infected with the fungus it can prove fatal. 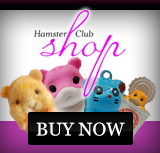 Due to the fact that the fungus is transmitted by air-borne spores any other hamsters should also be treated.